The Cisco IP phone system has a feature called call stacking, which allows for multiple calls on one extension, up to 2 incoming and up to 2 outgoing calls. You can switch between the calls. On each extension, you can receive up to two calls at a time. However, even with two incoming calls on the extension, you can still make up to two additional outgoing calls using the New Call softkey. Only one call at a time may be active on an extension, all other calls are placed on hold. Answering a new incoming call automatically places the current call on hold. 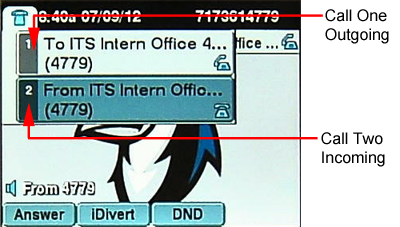 To switch between calls, the active call must be placed on Hold and the desired call selected (using the navigation pad) and resumed (using the Resume softkey). If your phone shares an extension with other phones in your department, an incoming call will be “owned” by your phone when you answer it. Owning a call means that the call is tied to your phone and is no longer visible on other phones in your department. See Holding and Resuming Calls and Switching Calls for more information.